Language teaching in today's society should consider how the use of ICT and social networking influence learning, which, due to technology, very often occurs in multilingual milieus. The project outlined here (which forms part of the larger research project PADS) aims to study learners’ communicative practices during the development of a global pedagogical project –in this case a Project-Based Language Learning context that includes the use of virtual worlds and telecollaboration – in order to better understand the complex layers that make up communicative competence in such environments. The research looks at the multimodal nature of communication and the development of multiple literacies that are employed in communicative situations that are both intercultural and interdisciplinary. Entitled 'Healthy Habits', the project was designed from a perspective that language practice and knowledge acquisition are part and parcel of the same process. Learning can be understood as the transformation of information into knowledge through social actions which take place about and through language. Healthy Habits aims to link knowledge building (searching for information, gathering information, processing information, transmitting information, transforming information and using information) with the use of various technologies and modalities. 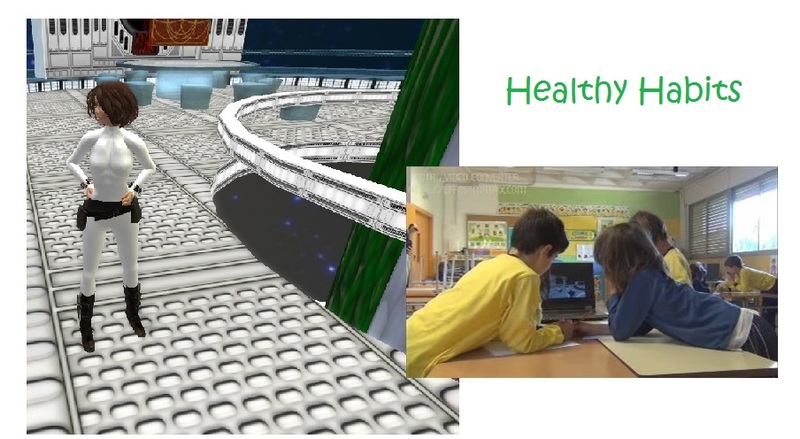 Healthy Habits combines in-class teaching strategies (role-playing, dialogic use of common resources such as flashcards, posters, worksheets) with more technological resources (Machinima created in a virtual world, videoconferencing) to encourage students to ‘act’ as scientists so that they can explore, in a cross-disciplinary fashion, cause and effect relationships of different habits. The use of common social media allows students to engage in collaborative learning with international partners as they delve into the habits of three ‘subjects’: Gameboy Gary, Hungry Helga and Smelly Susan (specially created avatars). Planning, material design and creation, and implementation was carried out in tandem between members of the GREIP research team at the Universitat Autònoma de Barcelona (Spain), a teacher educator at the University of Illinois at Urbana Champaign (USA) and teachers at the St. Jordi School (Mollet del Vallès, Catalonia, Spain) and teachers at the Praxis Volkschule (Vienna, Austria).